SANTA CRUZ, Calif. - Santa Cruz Warriors center Deyonta Davis has signed a 10-day contract with the Atlanta Hawks, both teams announced today. 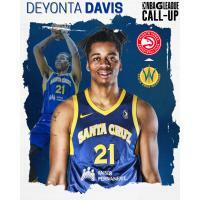 Davis, who will wear number 4 for the Hawks, is the first GATORADE Call-Up for the Santa Cruz Warriors this season and the 23rd NBA Call-Up in franchise history. Davis has started 43 games this season for Santa Cruz, averaging 9.7 points, 7.5 rebounds, 1.3 assists and 1.33 blocks on 59.1 percent shooting from the field (199-of-337 FG). Since February 1 (11 starts), the center from Muskegon, Michigan has averaged 15.6 points, 10.0 rebounds, 1.3 assists, 1.27 steals and 1.63 blocks on 65.6 percent shooting from the field (84-of-128 FG). Davis (6'11, 245) was selected with the 31st overall selection by the Boston Celtics in the 2016 NBA Draft, with his draft rights acquired by the Memphis Grizzlies, along with Rade Zagorac, for a future first round selection. Davis spent two seasons with the Grizzlies, averaging 4.3 points and 3.2 rebounds over 98 games (six starts). Davis spent one collegiate season at Michigan State University, averaging 7.5 points on 59.8 percent from the field (119-of-199 FG), along with 5.5 rebounds and 1.83 blocks over 35 games for the Spartans (16 starts). The Santa Cruz Warriors will conclude the 2018-19 NBA G League regular season with a three-game homestand at Kaiser Permanente Arena this week, starting Wednesday, March 20 against the Capital City Go-Go. The first 1,500 fans in attendance that night will receive a Warriors water bottle, courtesy of Kaiser Permanente. For tickets to Wednesday's water bottle giveaway and for all Warriors home games, visit santacruzbasketball.com or call (831) 713-4400.